Redco™ Ultra High Molecular Weight Polyethylene (UHMWPE) has extremely low moisture absorption, a very low coefficient of friction, is self lubricating and is highly resistant to abrasion (10 times more resistant to abrasion than carbon steel). Redco™ UHMW has the highest impact strength of any thermoplastic presently made and is highly resistant to corrosive chemicals, with an exception of oxidizing acids. 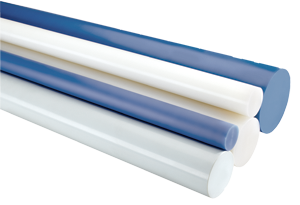 Redco™ UHMW plastic is known for its durability, machinability, versatility and cost-effectiveness. Virgin UHMW is FDA compliant and is used in applications where high levels of friction are likely to arise including chain channel, wear strips, belt scrapers, guides, and rollers. Redco™ UHMW can be machined into virtually anything from small bearings to large sprockets and liner systems. Due to an extremely low coefficient of friction, its inherent lubricity minimizes friction resulting in a smooth, noiseless operation. Outperforming and more cost effective than metal in many applications. Redco™ UHMW is highly durable and available in a wide variety of formulations and grades. Its coefficient of friction is significantly lower than nylon and acetal, and is comparable to PTFE, with superior abrasion resistance. It is odorless, tasteless, and nontoxic. Redco™ UHMW is proven to outlast mild and hardened steel by as much as 10 to 1. Redco™ UHMW is ideally suited for a variety of applications to remedy material hang-up, and accelerated wear due to abrasion or corrosion.